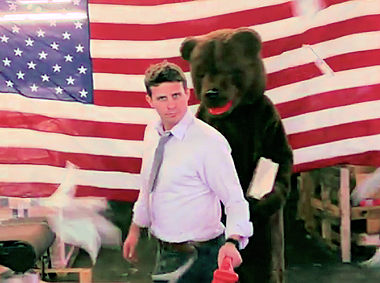 We all know the story of the Dollar Shave Club video. It was really funny, it went viral, and it helped the razor-selling start-up that created it make a huge splash. So the lesson here is clear: If you want your start-up to break out from the pack, you need a viral video — five million YouTube views and counting — too. Right? Right. Except you probably can’t make a viral video. Because if it were easy to do it, then everyone would do it. Still, you can improve your odds. Dollar Shave CEO Michael Dubin stopped by the Ad Age conference this week (he was picking up a “Viral Video” award) and gave us a couple minutes and a couple tips. One how-to he could have mentioned to me beforehand — don’t shoot your stuff in a stairwell. Side note: The thing I find most interesting about the Dollar Shave Club video is that Dubin had the video before he had the start-up: He shot a rough cut of the clip last fall and used that as part of his funding pitch. And once he rounded up his money — from the likes of Andreessen Horowitz and Kleiner Perkins — he figured he’d use the clip as an ancillary bit of media, not his primary launch tool. His backers set him straight, he says. “They told me, ‘The video is the thing,'” he says. And they were right.